Easy homemade mango fruit leather – no sugar added! Summer’s here, which means it’s time for orange snacks, and Orange is the New Black. We’re not going to take our orange snacking quite far with that as we did last year with Orange is the New Snack. But still, we’ve got a yummy snack in store for you for your kids to take with them to their camping and hiking excursions, and for you while you’re watching the new season of Orange is the New Black on Netflix. This month’s snack is mango fruit leather, made possible by the Ataulfo mangos that are hitting their peak season right now. These small yellow-gold beauties have a firm and creamy flesh with no fibers, so they’re great for snacking, blending into smoothies, or making into fruit leather. And we love the idea that these golden, fleshy fruits turn into dark orange, chewy snacks after just a few hours in the pokey…er, oven. Making fruit leather is far easier than you think it will be… and you truly do not need to add anything besides fruit. (Why add sugar when it’s already so sweet?). It takes a few hours to dry out, but during that time you can be doing just about anything else you want to – this fruit leather is extremely low maintenance. 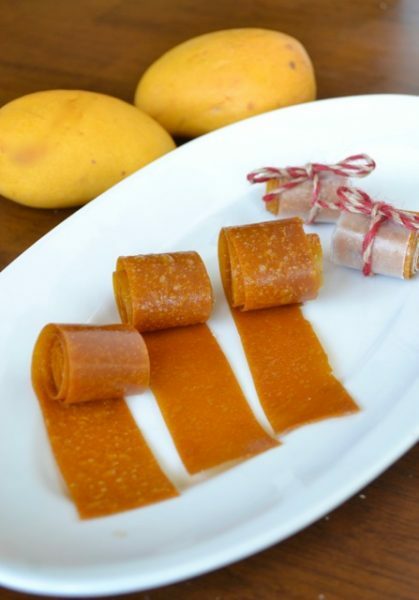 Pureed and dried mango, made into a fruit leather that's perfect for snacking on the go. Peel and dice the mango flesh, and puree the mango in a food processor until no mango chunks remain and the mixture is a thick liquid. Line one or two baking sheets with a silicone (silpat) liner. Carefully pour the puree onto the liner and spread it flat with an offset spatula so that it is about 1/8 inch thick all the way around. Bake in the oven for four hours, or until the fruit leather is no longer sticky/moist to the touch. Remove from oven and place a piece of waxed paper on top of the fruit leather. Then flip the fruit leather over and peel off the silpat liner. 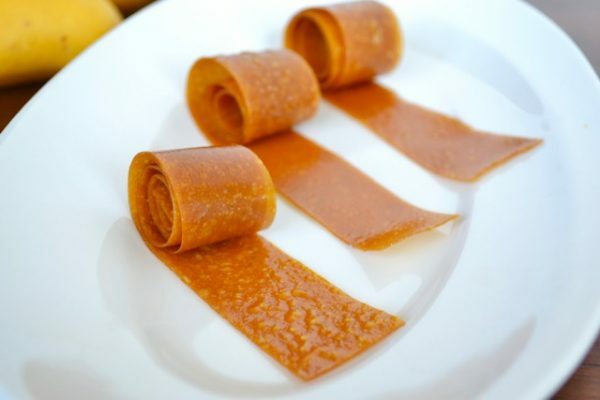 Cut the fruit leather (still attached to the waxed paper) into strips for easy rolling or serving. 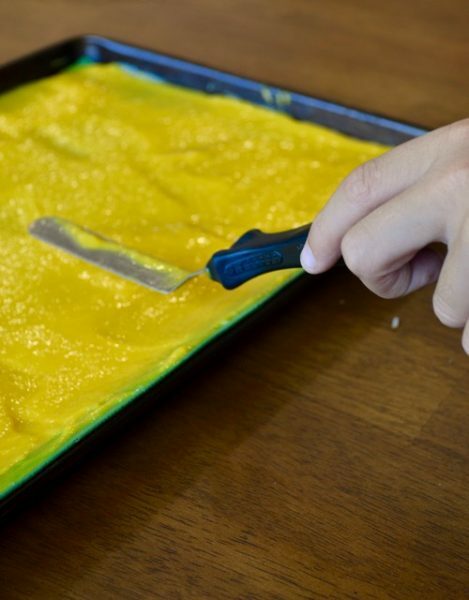 A few tips: Make sure you spread the mango mixture very evenly; otherwise any thick portions you have will take longer than everything else to dry out. Also, it’s OK if the outer edges aren’t perfectly straight because you can trim off any strays once you’re ready to cut and serve. For cutting long straight lines, you can use a pair of scissors or even a pizza cutter. 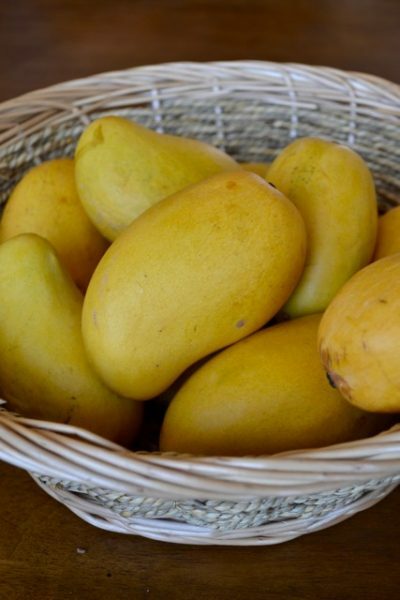 And last but not least, don’t be surprised at the end of the drying process when your golden-yellow mango mixture has turned a dark…orange. This fruit leather should be kept in an airtight container and it will keep for about a week. Your best bet is to make it right before your camping trip (or right before your OINTB party) and serve it while it’s at its freshest. Enjoy! 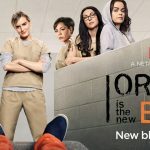 Blogger Disclosure: I am a member of Netflix’s blogger StreamTeam, which means they provide me with a Netflix membership in exchange for regular posts. All opinions expressed are my own.